We are Vegetable Tannin Manufacturer and Exporter which is also called as Cutch Catechu Extract Tannin, Catechu Extract and Cutch Extract. 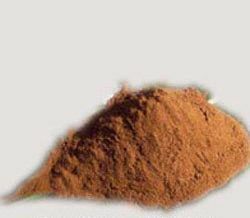 Also known as :Tannins Product, Acacia Extract Tannin, Cutch Tannin, Cutch, Cutch Powder, Catechu Tannin Powder, Catechu Tannin, Vegetable Extracts Tannin,Vgetable Tannin, Food Grade Tannin, Cutch (Catechu) Extract Tannin, Tannin, Quebracho Tannin alternative, Mimosa Tannin Alternative, Leather Tannin, Natural Tannin, Wood Tannins, Plant Extract Tannin etc. Cutch Catechu Extract is majorly used in Leather for making Vegetable Syntan , Silk & Fabric Dying and also used in tanning of leather. It is also used in veterinary, animal feed industry & Food Industry. It is made from acacia tree. Catechu tannin is a alternative of Mimosa and Quebracho.We can also manufacture the product by spray drying process as per your requirement. Cutch (catechu) Extract the Products are used in following : Leather Dying & Tanning Acid Veterinary & Animal Feed Products For leather industry for tanning Physical and chemical properties : Reddish brown color High tannin content Excellent tanning properties Uniform quality Not dusty powerful astringent Easily soluble in cold water Properties : Moisture content: 10-12% Ash content at 85°c: 4-6% Tannin content: 50-60% Specific gravity at 20°C: 1.54 g/cc Bulk Density: 0.71 gms/ml Solubility in water: 800 g/liter Viscosity mPa.s at 30°C-400g/l solution: 20 pass.